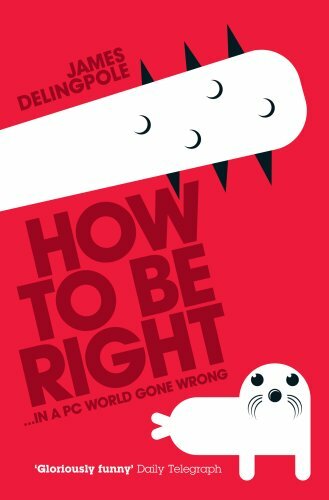 How To Be Right is an A to Z of the zillions of things wrong with politically correct Britain after twelve years under Tony Blair and Gordon Brown. It’s the perfect downstairs loo book with entries on all your favourite subjects: The French; Non-Competitive Sports Days; Multiculturalism; Ethnic Monitoring; etc. The shortest entry is on former Prime Minister Ted Heath. It consists of one, four-letter word, beginning with “c” and ending in “t”. “Funnier than Clarkson” said one critic. And I agree, obviously, though it hasn’t nearly had the sales to match. Not sure why. Perhaps people weren’t sure whether I meant it or not. (I do: every word, except where I’m deploying weapons-grade sarcasm, obviously). Perhaps I’m just too right-wing for a culture which has been brainwashed into thinking that collectivism, progressive values, PC etc are the best way of making society kinder and fairer. Perhaps by calling it How To Be Right I alienated all those libertarian lefties out there (the boys and girls of Spiked Online and the Institute of Ideas) who share my views but don’t consider themselves right wing. Dunno. All I do know is that it’s a great book, funny because it’s true. You will like if: you’re properly, soundly right-wing; you’re left wing but believe in Enlightenment principles of empiricism and liberty; you have a sense of humour. You will hate it if: you’re a whining, humourless, self-hating left-liberal who can’t accept the truth about the world. You will be confused by it if: you’re one of those “Compassionate Conservatives”, (or RINO Republicans) who is not totally with the programme. Conservatives who believe in man-made global warming, for example: you’ll disagree with this book.